Sport and Remedial massage is a great way to help with the common muscular issues we face today because of poor posture and high demanding jobs. Sports massage can help with spinal pain, tennis/golfers elbow, frozen shoulder, runners knee and plantarfascilitis as well as many other soft tissue problems that can affect your body, muscles, tendons and ligaments. From an early age, sport and fitness played a big part in my life. I played netball and tennis to a good standard, and was lucky enough to represent and captain Dorset at junior cricket. A serious hip injury put paid to ambitions of going into the RAF, but having already gained numerous fitness industry qualifications, I trained to become a Sports Remedial Massage Therapist. 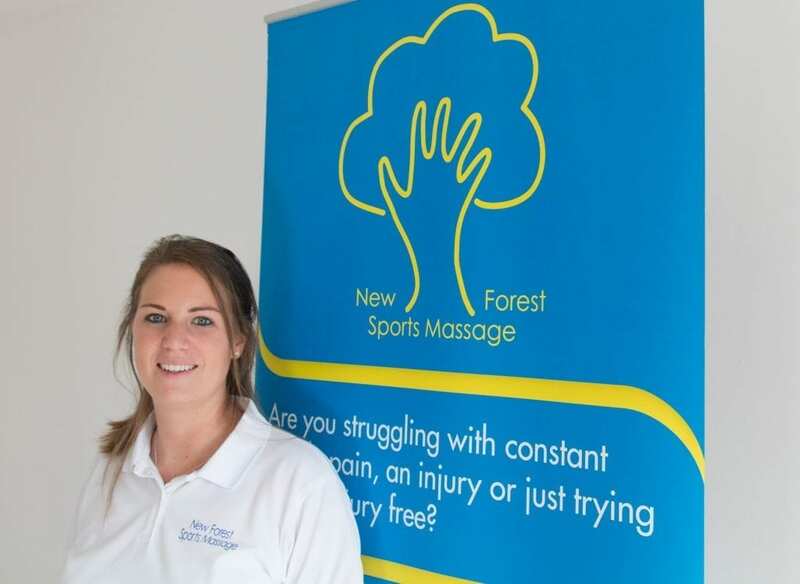 I qualified in 2009 from the prestigious London School of Sports Massage and started my own business, New Forest Sports Massage, the same year. Since then I’ve treating local athletes and patients, providing them with a service that improves their performance and reduces pain. I strive to keep on top of current trends, immersing myself in new theories and improving my knowledge by constantly adding to my qualifications. As a massage therapist with added skill I can add Osteopathic Manipulation to your session. Joint manipulation is a procedure applied to a specific joint to help restore normal movement. This is when sometimes you will hear a ‘click’ within the joint this is a release of gas, Overall the joint will then be able to slide and glide and pain will ease. Taping is widely used in the prevention, treatment and rehabilitation of sports injuries. Taping may be defined as the application of adhesive tape- elastic (stretch) or non- elastic in order to provide supports and protection to soft tissue and joints with minimal limitation of function. Where do you begin?! Everywhere you look you have media coverage about ‘Superfoods’, ‘good fats’ ‘bad fats’ what you should do to lose weight, It’s all calories in and calories out! It’s never been as simple as this, and is a lot more complicated, so that should firstly put your mind at rest, you haven’t done anything wrong! How many ‘FAD’ diets have you tried? And either succeeded for a short term or given up before you reached your ideal weight/goal? It is rare that I have any clients ask me’ how food can make them stronger’? Usually it’s all about aesthetical reasons. If like myself you were fed up of hearing all these different views about food and even trained on nutrition courses and don’t know where to start or what to believe, then come and hear what I have to say and how I can help you make it easy! No counting calories or weighing food a more simple way of testing, and listening to your own body and make it more efficient in utilizing food groups.